A task management system for a beautiful, efficient life. 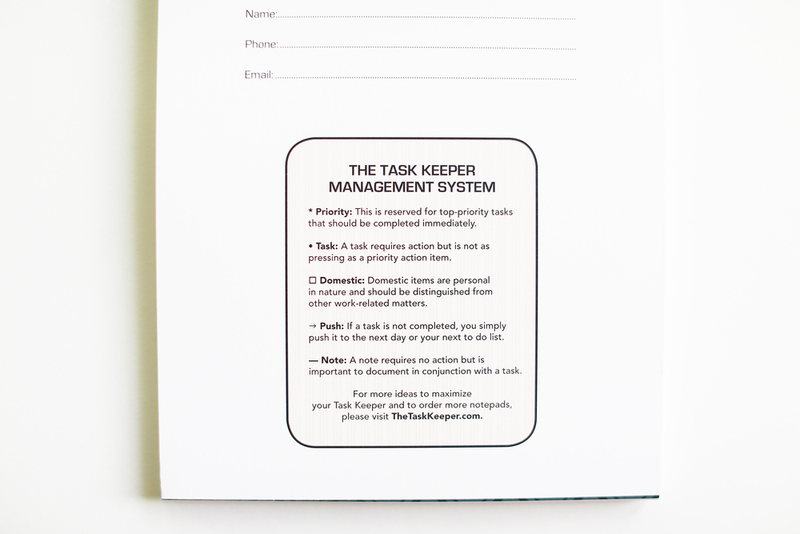 The Task Keeper is a refreshed steno pad notebook in the traditional 6x9 size, bound with a spiral wire at the top. Each steno pad comes with two uniquely designed, beautiful outside covers and each inside page is printed front and back. This efficient feature provides the opportunity to fill up one side of the notepad with tasks, simply flip it over and begin again with fresh pages and new cover art. Due to an "unfortunate accident," the print shop also helped us create the side-bound Task Keeper Collection, now available for purchase as long as supplies last. To hear more about this fun mistake, listen here. Incorporate a simple code into your refreshed steno pad to increase efficiency without overcomplicating life. The inside pages of The Task Keeper are intentionally designed to maximize efficiency and streamline your task list. Dotted lines allow for increased creativity as opposed to the ridged nature of standard hard lines. A task management system code at the bottom of each page gives guidance and direction to organizing your to-do list: What's a priority? What's a non-work related task? What can be pushed to tomorrow? What notes do I need for a specific task? Questions? Please email us at TheTaskKeeper@gmail.com. Copyright (C) 2015 by Jenna Worthen. All rights reserved.